Towards the end of the XIIth century, Amalfian sailors - when it was cloudy and hence impossible to plot a course by studying the position of the Sun or stars - began to use an instrument consisting of an iron needle floating in a container of water. The needle, which needed to be magnetized regularly by a lodestone (magnetite), allowed the North to be identified. By the next century this rudimentary instrument had become the compass, as we know it today, i.e. an oscillating needle suspended on a pin in the middle of a circular graduated card and enclosed in a box with a glass cover. Wrongly attributed to an imaginary character Flavio Gioia of Amalfi, owing to an incorrect interpretation of an extract from Italia Illustrata by Flavio Biondo (1388-1463), the compass had actually been invented in the IVth century AD by the Chinese who apparently already knew about the directional properties of magnetite as early as the Ist century BC. In this exemplar, signed Scalvino in Milano 1805, the needle, with a hard stone (a carnelian) on top of it, is attached to a graduated circle - the compass card - which gives the position of the cardinal points in relation to the longitudinal axis of the ship and, thus, the direction of its course. The north is indicated with a fleur-de-lis of the Angiò family, in accordance with the custom introduced by the Amalfians. The case houses a small quadrant with a graduated limb to be inserted in the outer ring of the compass, and three supports that allow the compass itself to be used , with the quadrant mounted, outside the box. A catch under the suspension pin of the compass needle allows this latter to be locked. 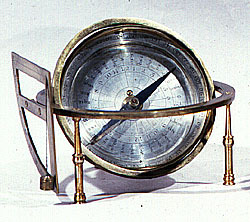 The absence of sights on the quadrant and compass means it was probably not used as an azimuth compass and the small size of the quadrant made the instrument inaccurate, suggesting it was probably used for teaching or demonstrational purposes. F. Farinelli (1979), p. 190. G. L'E. Turner (1991), p. 232.